A choice of the ornamental arts of the temples on Dieng Plateau. In the 8th century CE a sacral temple city was erected on the high plains of Dieng Plateau. 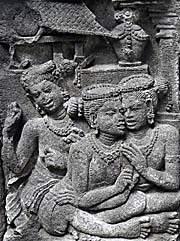 The remaining temples of the Dieng culture represent the oldest stone buildings on Java. The first thing what comes in mind when talking about Javanese culture are the great monuments of Borobodur, Prambanan, the Dieng Plateau and many other sights and places. Apart from these more spectacular places, traditional Javanese culture consists namely of gamelan music, wayang shadow puppet plays and batic. There is a contemporary art as well, but I didn't notice much of it. It's, as everything nowadays, completely commercialized and, as it seems, designed to be displayed in wealthy places like banks, insurances, other big companies, lawyers offices and the riches homes. From Java comes a significant contribution to Southeast Asia's literature. Pramoedya Ananta Toer wrote a number of meaningful books on Indonesia and achieved a worldwide recommendation as a significant author. The Javanese nobleman prince Diponegoro (1785-1855), who was the leader of the insurgence against the Dutch in the Java War of 1825-30, was sent to exile to Celebes after his defeat. There he wrote an autobiography ('The Chronicle of Diponegoro') which represents a remarkable and sensitive document of Java and it's people of the time. His record is since 2013 a 'Memory of the World' document of the UNESCO. Most fascinating in my eyes (ears) is gamelan music, which is really sophisticated orchestral music giving an intensive and impressive sound. The spirit of gamelan is completely different to everything I have seen on contemporary Java. It's the sound of an ancient, practically forgotten society. Gamelan overreaches all the contemporary crap of music skyscraperlike. It's something deep, real and serious, in sharp difference to all the mere commercial and banal announcements of our days. 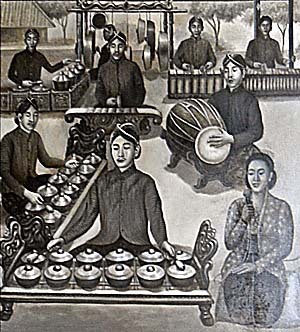 Sabilulungan, a classical piece of gamelan music. Gamelan is original Javanese and a centerpiece of it's culture. The orchestra consists up to 75 instruments, including xylophones, gongs, a kind of violin, flutes and zithers, drums etc. 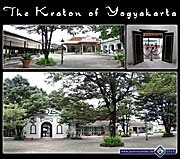 Gamelan orchestras are to see and hear sometimes in the expensive hotels or, most famous, in the Kraton of Yogyakarta. 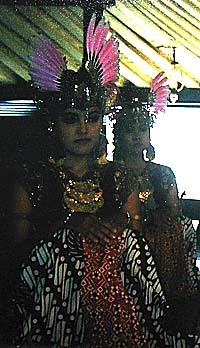 There are also shows including traditional Javanese dancing (warang orang). 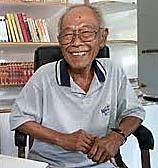 The best known Javanese author is Ananta Toer (1925 - 2006). He is worldwide considered being the most important Indonesian author of the 20th century, if not for all times, at least until another author might 'top' him anyhow. His works were translated into 37 languages. The both works of him I read personally are the essay 'My Prison Mate', in which he describes his time in a Dutch prison during the Indonesian independence war and the novel 'Gadis Pantai' (English: 'The Girl from the Coast'), in which he describes the live at a traditional Javanese court. It's semi-fictional and based on experiences of his own grandmother. Toer's writings show the sufferings and hardships of the Indonesian people over a historical time. It explains much of what the traveller faces in Indonesia now: poverty, anomie and cultural loss. Toer is definitely one of, if not the most significant author of Southeast Asia. While the independence war between 1945-49 he joined nationalistic forces, later he became close to communist ideas. Years after the war he spent a time in the Netherlands and made journeys to the Soviet Union and China. Despite he was a famous author abroad, his writings were under censorship in Indonesia itself for a long time until 1999. Toer was struggeling with the Sukarno regime (due to a publication concerning corruption) and much more with the following Suharto regime (for being close to the Communists) in Indonesia. In Suharto's dictatorship Toer was imprisoned for 15 years without trial, where he created his main works. It was rather likely that he got killed as at least 500,000 other leftists after Suharto's coup d'état. Despite he was forbidden to work and had no writing materials, he formulated the 'Buru Quartet' in oral form and got it smuggled out with the help of other prisoners. Ananta Toer was realeased from prison due to an intervention of the American Carter administration in 1979; from then until the end of Suharto's dictatorship he was under house arrest. Although the famous shadow theatre is considered to be typical and original Javanese / Balinese, it's not completely sure if it does maybe has it's roots in India. The shadow theatre consists of narration, dialogues, puppets and, of course, one or more puppeteers. Wayang is not only a court art but has centuries of history as a folk tradition as well. It's the strongest traditional theatre form in Southeast Asia and widespread around in the area. There is for example a shadow puppet museum in Songkhla / south Thailand; the puppets there show quite the same style like they are here on Java. There is a huge variation of stories played with the puppets. Classical stuff is of course the Ramayana and other old Hindu epics, as well as a lot of stories about royal dynasties, wars as well as stories of common people. The plays are often accompanied by gamelan music. Wayang passed through a centuries long development and developed a number of different kinds; some of them are younger and date back to the 20th century. 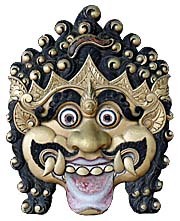 Older forms date back to around the year 1000 AD, like the wayang topeng (masked dance), which was performed at eastern Javanese courts in these times. Wayang orang is a spectacular dance-drama, which grew out of the unmasked dance tradition that is illustrated in reliefs of female dancers in the Borobodur and Prambanan monuments. That shaped the female group dances of the Surakarta (Solo) and Yogyakarta courts in the 16th century. 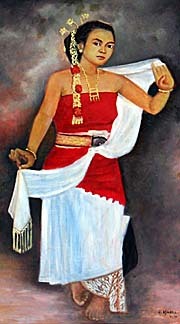 There are modern types of popular theatre, like ketoprak and ludruk, in which a clown figure is the spokesman of the common people. Songs and dances are also accompanied by gamelan music. The Javanese painter Raden Saleh (Syarif Bustaman, 1811-1880) is considered to be the 'father' of modern Indonesian painting. He was born into a very prominent Javanese noble family and came in early years in contact with the world of the Europeans. Interestingly, the Bustaman family supported the Javanese prince Diponegoro in the Java War of 1825-30, when a great part of the Javanese fought against the increasingly demanding Dutch rule. 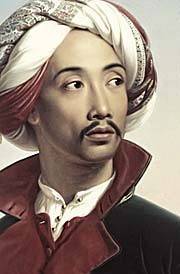 Raden Saleh travelled to the Netherlands in 1830 where he studied art. He was the first Asian and generally non-European who got an European education and developed a self-conception as a modern artist. He spoke five languages fluently, among them Dutch and German. In 1839 he travelled to Germany and spent years at the court of the duke of Sachsen-Coburg and Gotha (the German sideline of the Victorian English royal family, who renamed themselves later to the 'Windsors'). Raden Saleh was introduced into the highest circles of nobility in Europe, what certainly contributed to his fame and the fact that his paintings still nowadays are dealt in millions of US$ on the international art markets. Some of his paintings are presented in Windsor Castle and Buckingham Palace. He spent altogether 22 years in Germany and was a co-founder of the German branche of Orientalism in paintings and partially also active in architecture. Remarkable that he had a white servant, inverting the common pattern of the time that usually 'white', western people never served to any of the colonialized people. For some Westerners of the time it was seen as a scandal. Raden Saleh's palace in Jakarta is designed after palais Callenberg near Coburg and is nowadays a tourist attraction; it is designed to be turned into a new 'Prince-Raden-Saleh Museum'. 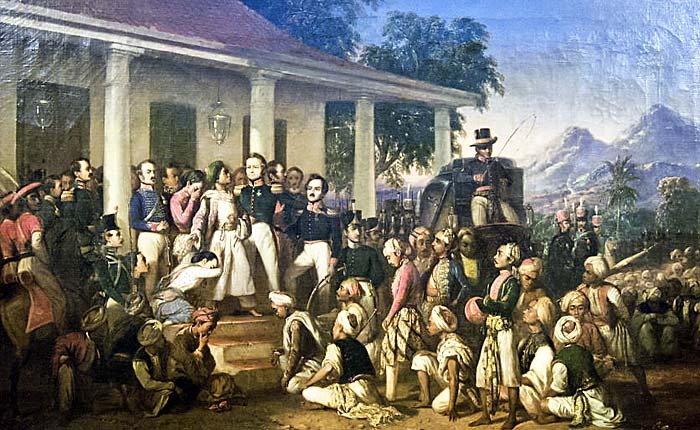 Diponegoro's arrest, happened in 1830, painted by Raden Saleh in 1857. At Diponegoro's left hand general de Kock, the leader of the Dutch troops, is to see. He took Diponegoro prisoner despite the fact that he came to the peace negotiations under a flag of truce. It looks as the event took happen in Yogyakarta. In this case the both mountains in the background are Mount Merapi (right) and Mount Merbabu (left). 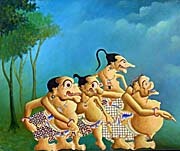 The painting is now exhibited in the museum of the government palace in Jakarta. Batic as a traditional art is nowadays part of the textile industries and as a mass product widely available in all the shopping centers. A center of production of Batic articles is Surakarta (Solo), where many textile factories are around. Though I doubt, that products therefore are cheaper in Solo than elsewere - that might have been so in the past.